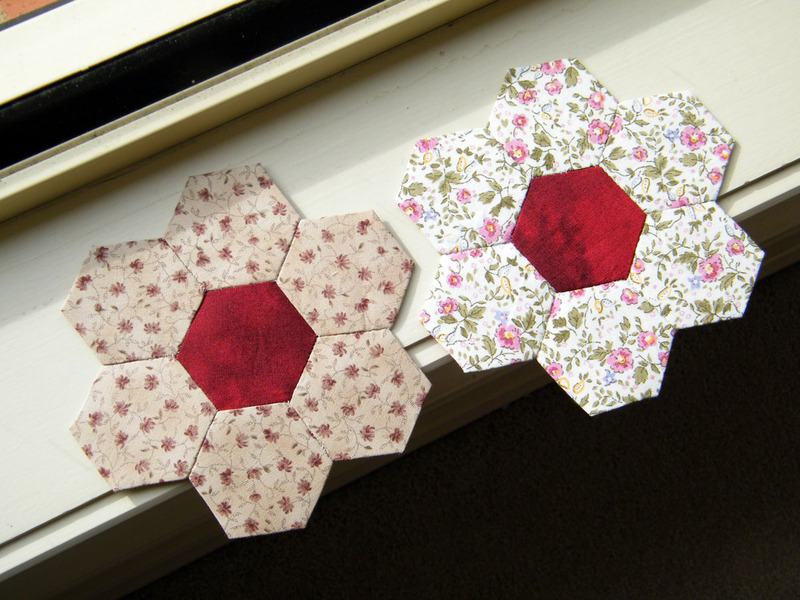 Rambling around my Life: Some Hexie Flowers and Fifties Dress No 1 for "Dress Me Up"
Some Hexie Flowers and Fifties Dress No 1 for "Dress Me Up"
It can be difficult as some people are quite specific as to what they want. I mean, red centre, or cream centre, or bright, or pastel are fine, but once specific ranges are mentioned it becomes hard. I don't know one range from another and only buy fabric because I like the colour or pattern. 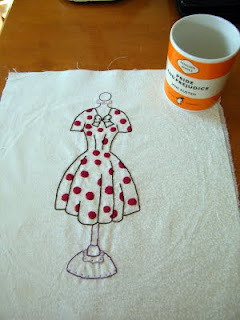 Then I made some progress on the dresses for Dress Me Up from the Bobby Socks Quilt Company. This is the first dress finished. Slow work. I am a great copycat. It was seeing someone else doing this pattern which got me started. Perhaps I should just say that I find other people's work inspirational. And that applies to coffee mugs too. I got all nostalgic when I saw another blogger's Pride and Prejudice mug done in the old, familiar Penguin colours and wasn't content until I had one too. I've started on Dress No 2. I'd had great trouble getting a nice line in the black backstitch using two threads of DMC. So this time I wanted to use a single thread in a heavier weight. 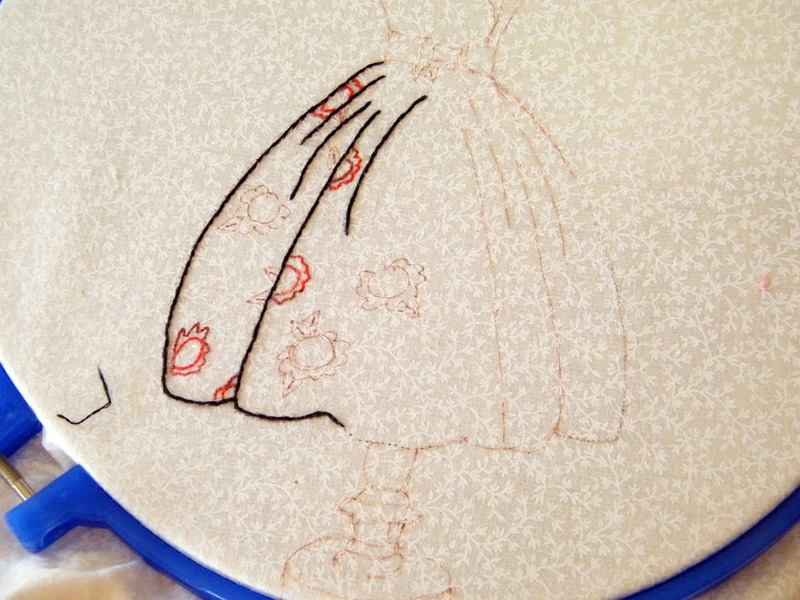 I am using Aurifil Mako No 12 for the black and am doing split stitch instead of backstitch. Anyone know any other of the thicker threads I could try ? The roses were too fiddly to trace so I am just sketching them on as needed. The flowers are worked in a single strand of variegated Cottage Garden Threads. your flowers looks lovely, it can get a little confusing trying to accomodate specific requests but you can just do the best you can. Your embroideries look great, we all inspire each other, that's what blogging is for! Great that your mug has arrived!! Your hexie look good and I do like your stitchery. 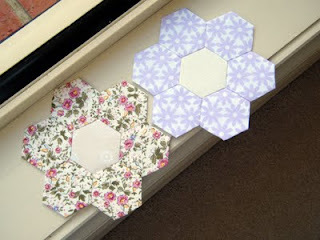 I think I am your swap of July but I have not received your hexie. Anna, I have replied to you via e-mail about the missing hexies.